The most frenetic farm you've ever seen! Turn a small piece of farmland into a thriving Super Ranch! Use upgrades to buy processing equipment, mills and buildings - all while defending your property from pandas, crows and beetles intent on ruining your harvest. 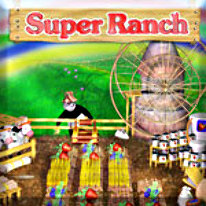 With tons of clever upgrades and trophies, farm products to sell, and buildings to purchase, Super Ranch is an adventure for the entire family.